Robin Evans said that while she does not support the senate candidate Alison Lundergan Grimes or President Obama she has taken advantage of the Affordable Health Care act. Kentucky is arguably one of the health law’s biggest early success stories, with about 10 percent of the population getting coverage through the state’s online insurance marketplace — albeit mostly through Medicaid, not private plans — and none of the technology failures that plagued other enrollment websites. The uninsured rate here has fallen to 11.9 percent from 20.4 percent, according to a recent Gallup poll that found only Arkansas experienced a steeper decline. But there is little evidence that the expansion of health coverage will help Kentucky Democrats in this fall’s midterm elections. Republicans hold all of the state’s Congressional seats except for one, in a district centered in Louisville, and none are considered vulnerable this year. Republicans, who already control the State Senate, have a chance of taking the State House of Representatives, where Democrats hold an eight-seat majority. And several recent polls have put Mr. McConnell ahead of his Democratic opponent, Alison Lundergan Grimes, even though his approval ratings are tepid. Mr. McConnell and other Republicans here, while more focused on other issues, like protecting Kentucky’s coal industry, continue to attack the health law as a symbol of government overreach and Democratic bungling. And far from flaunting Kentucky’s strong enrollment numbers, Democratic candidates — most notably Ms. Grimes — have remained reticent about the law, even its successes. In many ways, the role that the law is playing in Kentucky politics reflects what is going on nationally as the midterm elections approach. The law remains deeply unpopular among Republicans and independents, and Republican candidates still use it to flog their Democratic opponents, although not as single-mindedly as before. That is partly because voters are more focused on other issues: A recentGeorge Washington University Battleground Poll found that among likely voters who think the country is on the wrong track, only 5 percent blamed “issues with Obamacare.” More pointed to concerns about the economy, foreign policy, President Obama and Congress. Why would people like Ms. Evans who are benefiting from the law vote for candidates who would dismantle it? Gov. Steven L. Beshear, one of the few Democrats forcefully promoting the law here, said many were driven by a dislike of Mr. Obama. A recentCNN poll found that only 33 percent of likely voters here approved of his job performance, and that 63 percent disapproved. Interest groups and candidates — including Mr. McConnell — have run more than 10,000 broadcast television spots here since January 2013 that mention the law in a negative way, according to Kantar Media’s Campaign Media Analysis Group. Kantar found only one positive television ad, from Elisabeth Jensen, the Democrat challenging Representative Andy Barr in the state’s Sixth Congressional District. The ad refers to Mr. Barr’s votes to repeal the law, warning that he “would restrict our access to affordable health care.” Ms. Jensen, who is running in a swing district, also ran a radio adpraising the law last spring. At the state fair’s annual ham breakfast, Mr. Beshear tried to humanize the law, describing how several farmers in attendance had signed up for the new coverage and how one had used it to check out a spot that turned out to be skin cancer. That message has not persuaded people like Billy Bishop of Lexington, who is retired and gets health insurance through his former employer. He said his out-of-pocket costs had risen sharply while his coverage had gotten worse. He blames the Affordable Care Act — particularly its expansion of Medicaid to many more low-income Americans. 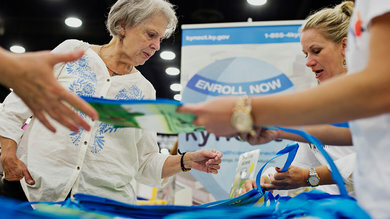 Nonetheless, at the state fair, Mr. Bishop, 57, and his wife, Cindy, 56, stopped by an information booth run by Kynect, the state’s health insurance marketplace. Mrs. Bishop was curious about whether she could get less expensive coverage through Kynect, even though her husband refused to consider it for himself. 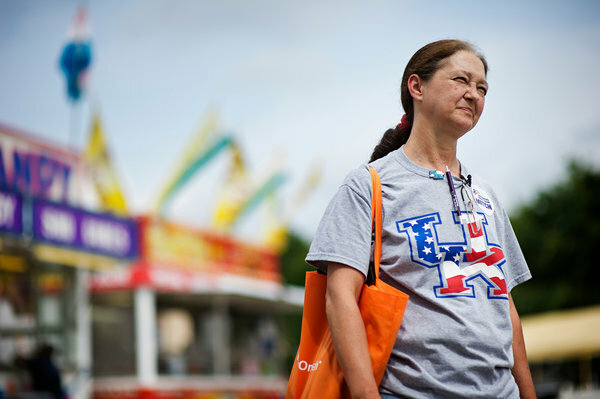 At the teeming fairgrounds in late August, the Kynect booth handed out 26,000 reusable shopping bags stamped with its logo and toll-free number, and more fairgoers were clutching them than corn dogs or cotton candy. Crowds also gathered around information booths sponsored by the managed-care companies providing Medicaid coverage for the newly insured, one of which had a star University of Louisville basketball player greeting passers-by one day. All the marketing did not sway Teri Eisenmenger of Louisville, who said she was against the health care law even though it had allowed her adult daughter to get Medicaid coverage. “I don’t like that people are being forced to buy insurance,” Ms. Eisenmenger, 58, said, referring to the law’s requirement that most Americans get health coverage starting this year or face a tax penalty. She is insured through her husband’s job at a car dealership, but the premiums are high, she said — $1,000 a month for the two of them — and they might join a Christian health care sharing ministry instead. Members of these ministries pay monthly fees that help members with medical bills, and they are exempt from the penalty for not having insurance. Despite his unyielding attacks on the law, Mr. McConnell also takes positions that suggest he knows it would be difficult to dismantle. He has hedged on whether he would take away Medicaid from new enrollees and suggested — without explaining how — that the Kynect marketplace could survive even if the law was repealed. At one such gathering last month, at Paul B. Hall Regional Medical Center in Paintsville, in eastern Kentucky, Dana Keaton Collett, the hospital’s director of rehabilitation services, told Mr. McConnell that her insurance rates were rising so sharply that it was not worth keeping her coverage. Ms. Grimes typically avoids talking about the health care law but, when pressed, says she wants to improve it. At acandidate forum here last month, during which Mr. McConnell called the law catastrophic, Ms. Grimes said, “We have to work to streamline the Affordable Care Act to make sure there aren’t overburdensome regulations on our businesses.” She also called for letting more people keep their old insurance policies, a point of contention that emerged last fall when several million people’s plans were canceled because they did not comply with the law’s coverage requirements. Some party activists and political analysts say Ms. Grimes is missing an opportunity to excite the Democratic base — and perhaps siphon votes from Mr. McConnell in places like southern and eastern Kentucky, where the drop in the uninsured rate has been especially steep — by not vigorously defending the law. “It may be her last, best chance,” said Al Cross, a longtime Kentucky political reporter. For now, Ms. Grimes is focusing on painting Mr. McConnell as a creature of Washington who will perpetuate partisan battles and gridlock. Some Kentucky voters seem receptive to that message. Karen Ekstrom, 60, who described herself as an independent voter, said she and her husband were deeply disappointed with the private insurance he got through Kynect. With the cost at $439 a month, “I really feel we are being ripped off,” she said. Ms. Ekstrom, who works for a medical marketing company in Lexington, is ambivalent about Mr. Obama. But she said she planned to vote for Ms. Grimes, mostly because she sees Mr. McConnell as spending too much time trying to block Mr. Obama on the health care law and other initiatives.